Figure: Right- and left-twisted molecular ordering in supercooled liquid water. Water is known to have various anomalous properties, and they are especially prominent below room temperature. For example, liquid water exhibits expansion when it is cooled below 4°C, and it keeps expanding when it is supercooled below the freezing point, 0°C. Finding a unified explanation of the anomaly of water is a long-standing challenge. It is important not only in physical chemistry but also in various other fields of science, such as biology and astronomy. The team obtained many configurations of water molecules in liquid water by a computational technique called molecular dynamics, and analyzed the local structures in water using a pattern-matching technique. Finally, they found that the special structure named “extended polytope” is the most abundant at low temperatures. 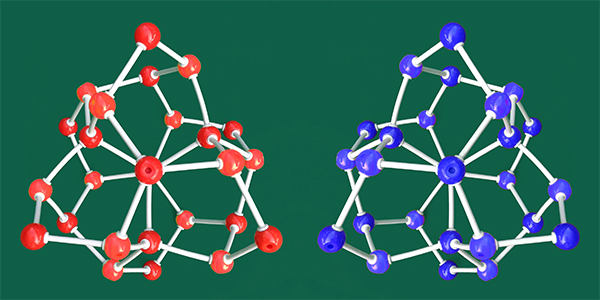 This tiny and twisted structure is as stable as crystal ice and exists as nano-sized grains. The grains are chiral, i.e. there are two types of the structure that are mirror images of each other. Their new analysis method enables a new way of recognizing order in the water molecules around biomolecules and in amorphous ice. The twisted structures of water might induce a new kind of interaction between the molecules dissolved in water, and might hinder ice nucleation. ・	Authors: Masakazu Matsumoto, Takuma Yagasaki, and Hideki Tanaka. ・	Title of original paper: Chiral ordering in supercooled liquid water and amorphous ice. ・	Journal, volume, pages and year: Physical Review Letters 115, 197801 (2015). ・	Affiliations: Department of Chemistry, Faculty of Science, Okayama University. OKAYAMA UNIV. e-Bulletin. Adsorption mechanism of inhibitor and guest molecules on the surface of methane hydrate. Vol.13, Dec, 2015.